AllNet is the best basketball-shooting device designed to improve your shot. AllNet will teach you how to properly control the ball through muscle memory and enhance your sense of touch. AllNet is scientifically designed after many years of research to improve your sense of touch and mental focus to teach you how to properly control the ball. Who is AllNet Basketball Shooting Device for? AllNet is for anyone looking to reach their true shooting potential. Palm and finger adjustable makes it great for anyone for ages 8+. Most coaches can teach technique & the correct bio-mechanics of the proper shooting form, but no one can give you the most important aspect of shooting, THE TOUCH. There is nothing out there that can correct the bad habits (except AllNet) so the coaches rely on verbal instruction to try and correct these bad habits, which verbal is one of the hardest ways to fix something. Today's philosophy of shooting 1,000 shots to get better is incorrect, this instills bad habits. Bad habits come from years of shooting incorrectly, those need to be corrected first to improve your shot. The most important aspect in shooting is your ability to be confident, calm and mentally focused on your release of the ball. AllNet heightens that mental focus and gives you that confidence. READY TO IMPROVE YOUR SHOT? CLICK ADD TO CART NOW. THE SECRET IS OUT! 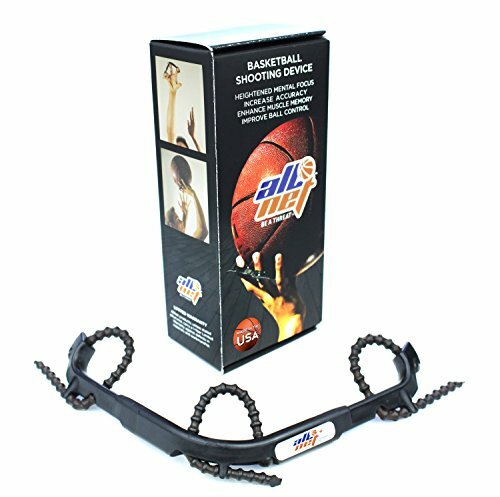 AllNet Basketball training aid will give you "THE SHOOTERS TOUCH"
PERFECT FORM ON YOUR SHOT - Designed to speed up the process of muscle memory. PUSHING your fingertips onto the ball raises your palm off of the ball. STOP WASTING YOUR MONEY! - Not all shooting aids are created equal! AllNet is the ONLY one of its kind in the market. Created by a basketball player FOR basketball players who are looking to vastly improve their shooting percentage. STRONG AND DURABLE - AllNet is created with super strong high quality ABS plastic. You will not wear this device out, if you do we cover it with a 1 year Warranty. BECOME A SHOOTER FASTER- Your shot will improve within 15 minutes of trying AllNet due to the amount of sensory input being received. Improve your shooting percentage now! EASY TO USE - Take on and off in 1 minute. Easily adjustable from a child to an adult. Four adjustable levels for hand size and finger size to custom fit your hand. If you have any questions about this product by AllNet, contact us by completing and submitting the form below. If you are looking for a specif part number, please include it with your message.